moved to www.skorchmag.com! : Disco Divas on Their Way to Funky Town! Just wanted to share a photo I snapped tonight while grabbing some snacks with the hubby at Wal*Mart!! LOL! 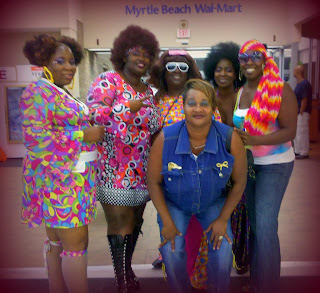 As we were getting to the checkout area, we noticed a bevy of beauties all decked out for the disco! Turns out they were stocking up as well, before heading out to a 70's themed party! I wasn't the only one who wanted to capture the moment, as many people were asking to take a group photos of the gals! What a colorful bunch they were! I hope your party was fabulous ladies!! thank you so much jessica for wishing us a funkadelic time..that we had and much more lol it was nice meeting you.